Wisdom of Life. : Successful selling goes without discounting. 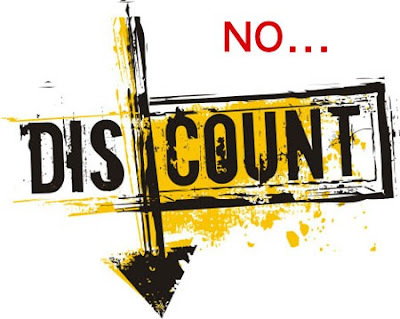 Many rookie agents used to ask this unavoidable question; "Are you giving discount?" Me! I don't because once you make it a practice, you have to give it all the time to those who purchase your products. Commission is our earning, our life blood, our food and incentives to work. Not forgetting as life insurance agents, we have no salary, allowance and bonus. We are not employees of the company but rather as contracted agents to represent a principle to solicit their products in range. We are considered as self-employed and professionals by our own. In my early years in this business, if clients could have asked this discounting issue, this was my answer to them. "I am sorry i can't give any discount because i need to do well and stay in this business as long as possible. Giving the discount might not allow me to earn more to provide my family a better & comfortable home. Giving the discount might deprive my dreams for my children to do well in their studies. Giving the discount might encourage me to look for another job because i earn lesser. By not giving discount you let me stay in this challenging business. By not giving discount you let me grow further with hopes and values. By not giving discount you let me stay permanently to serve you whenever you need me now or later of our lives." My above principle of no discounting when i sell is proven with my twenty eight years of successful selling of life insurance. The total earning received allows me to serve and service all my clients with pride and honour. I have developed myself to be competent and knowledgeable in my practices, thus be able to protect and care for all concerns to the highest level. I could perform and deliver my promises because they had paid me in full willingly. To all my fellow colleagues, if you intend to stay in this business be firm as what i had written. No discount please but make sure you serve with a smile. A friendly advice - "Don't deal with a buyer who doesn't pay but expects much."